Christmas is in the air. Probably most of us are already preparing there list and shopping gifts for family and friends. This is also the season of non-stop food trip, party and gimik nights. But for movie geeks like me, what excites us the most is the annual Metro Manila Film Festival. For those who think that the local movie industry is already dieing, you better think twice. Yes, we have been very disappointed with several local movies because of its poor quality and the film maker's mediocre approach on film making but admit it, in local standards this movies already reached what local entertainment haven't reached for the past few years. I think it is not wise to compare local grown films to our foreign counterpart especially to Hollywood because in reality we lack budget that surely affects production. This is the reason why I still have faith on our local films and continued to support them on their endless effort to give us good entertainment. Before we go too far. We already received the list of the participating movies in the upcoming 33rd Annual Metro Manila Film Festival and I think I find some who are worth watching. Here are my Movie list this year. 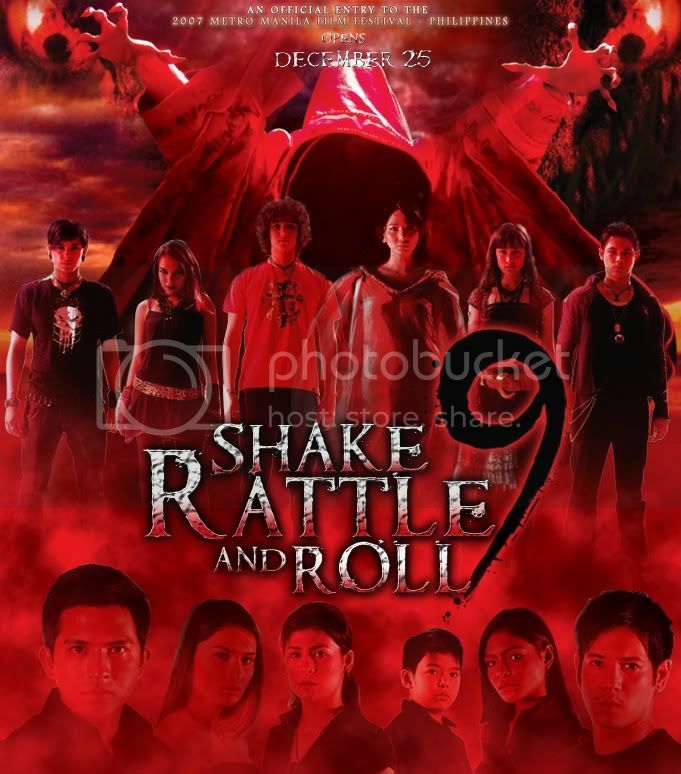 Shake Rattle and Roll 9. After the success of the previous installment, Regal Multimedia comes again with another set of spine chilling tales from the underworld that will surely send you in a non-stop nightmare. This movie includes three episodes, First episode titled Christmas Tree is Directed by Paul Daza, Second episode titled Bangungot is directed by Michael Tuviera and lastly the episode titled Engkanto which is directed by the new age horror director Topel Lee. Other than the great talents behind the camera is a stellar cast that includes Dennis Trillo, Roxanne Guinoo, Gina Alajar, Nash Aguas, Matt Evans and Melissa Ricks to name a few. Through the years, Shake rattle and Roll franchise had given the Philippine horror industry an identity that is completely unique from other Asian horrors and stick with the blend of a good story and a superior cinematography. This movie is indeed a great pick for your movie list this coming Christmas and be sure you watch this with someone unless you can watch it alone with somebody else. Bahay Kubo. Is a story of a woman who got her luck whenever she adopts children as her own child. From a simple pribinsyana, the woman's success in life didn't stop up to the moment there lives are already slowly thorn apart. The children are now fighting for there adoptive mother's love and the mother is forced to make choices just to bring her family back to the life they use to live, a life with Love and acceptance. Directed by Joel Lamangan, Bahay Kubo will set another family oriented film that can surely follow what the Mano Po franchise have already introduced to the public but off course with a pure pinoy taste. The cast includes such fresh talents like Shaina Magdayao, Marian Rivera, Yasmien Kurdi and Mark Herras. But what is a potential award winning entry if it doesn't have those who have the talent that surpasses the test of time and became household names in terms of local Drama. Veteran actresses Maricel Soriano and Gloria Romero joined forces once again to play the roles of Matriarchs that will surely give you tears with their acting prowess and a smile or two from their wit and humor. With this ensemble of cast, Bahay Kubo is a heart warming feel good movie just right for the whole family. Resiklo. 14 years in the future. Earth is attacked by an insect like alien race called Balangs (by humans). In the far east Asian country Philippines, few human survivors seek sanctuary to a place called Paraiso which also serves as headquarters of the renegade group formed to fight this foreign adversary. Crisval Sarmiento, an ex-military colonel is the leader of the group who protects the refuge from Mutanos (Mutated Human) and Balangs. In order to win, they need to counter the technologically advance weapons and machines of the opponents. They began creating weapons and machines from junk parts and scrap materials of everyday mechanical objects and military components. But despite all the effort, Love and Faith could be the most powerful weapon in this battle for good and human survival. From the makers of Exodus and Director of Encantadia comes a Philippine movie event of the year. Imus Production presents us Resiklo. Directed by Mark Reyes, starring Ramon “Bong” Revilla, Jr., Dingdong Dantes, Paolo Contis, Benjie Paras, Jennylyn Mercado, Michelle Madrigal, Jolo Revilla, Bryan Revilla, Ramgen Revilla, Empress Schuck, Luis Alandy, TJ Trinidad, and Roi Vinson. I admit it, the first time I saw the teaser trailer, I thought it was a foreign film. 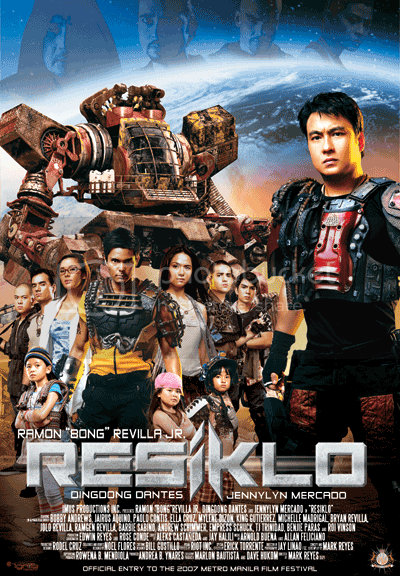 We can say that the special effects had already reached its peak in local movie industry with Resiklo. The 3D mechs are incredibly detailed though they are not so original when in terms of design (The mechs reminds me of Mech Warrior series). I can't say anything about the story but if I will base my opinion from the synopsis they provided, it seems the story is very generic. Aliens invades earth, survivors form renegade groups to battle the invaders and in the center of war is a Love story between the lead actors. Oh well. I hope the movie has more to offer when it reaches the cinemas. Bahay Kubo is the best!